Welcome to OLIVE & VINE! We are a family-owned European style tasting bar and retail boutique featuring 50 premium extra virgin olive oils and aged balsamic vinegars from around the world. When shopping in the store, we encourage you to sample as many products as you like before making your selection. We then bottle it on the spot ensuring the freshest oils and most flavorful vinegars in the world. If you can’t visit us in person, we invite you to shop online where all of our fine products are available for your selection. Looking for a unique gift? In addition to premium oils and vinegars, we carry beautiful Mediterranean olive wood accessories, gourmet spice blends and sea salts, Olivella bath and beauty products from Italy and olive oil themed cookbooks. Let us host your next event! 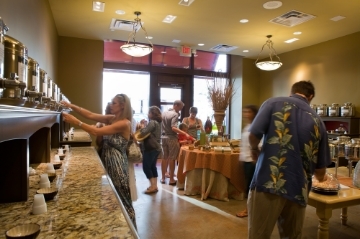 OLIVE & VINE is delighted to host a private tasting party for you and your guests. Our store can comfortably accommodate up to 35 people and our staff will be on hand to answer any questions and provide tasting sheets and pairing suggestions. Contact us for more details and to schedule your event. Custom labeled gifts for any occasion. Our custom label program is perfect for corporate and holiday gifts, wedding favors and special events. You choose the oils and vinegars and we will work with you to create a label with your name or company logo. Give us a call for more information.